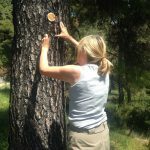 If you don’t want to buy my book but still wish to hike, get the www.geocaching.com app and try to find where I have hidden a cache. 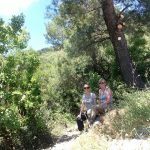 Using the gps co-ordinates I have put on the site, you can easily find them but they will always require a hike. At the moment, I have hidden two but will be adding to the collection as and when. Take a pen with you to add your name to the scroll and put it back where you found it for others to find. Happy hunting! Michael and Matt left this morning. 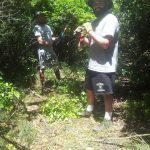 They were great volunteers and did an excellent job of clearing the trail from where the others had left off, up to the church of Ag Reginos. So this section is now totally open and ready for use. The next couple have cancelled and I’m now wondering whether to bother getting replacements as it’s getting rather hot and I’ve been working nearly solidly since the middle of April. The only remaining section is not clearing but creating; from Platanakia down to Elios. We’ll see! 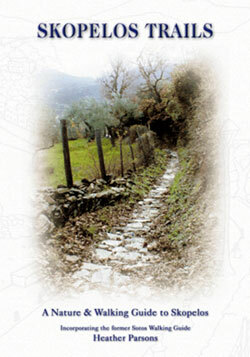 Trail portion Ag Reginos Pirgos is now open. 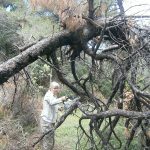 Today was spent clearing the forest trail of fallen trees from Ag Ianni Skleri towards Moutero. It is now clear and open for use. 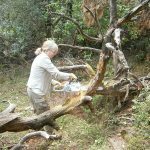 Together with Henni from Germany, the first volunteer of the season, we have made a start on clearing a beautiful stretch of calderimi that runs in the forest at Pirgos towards Ag Reginos. 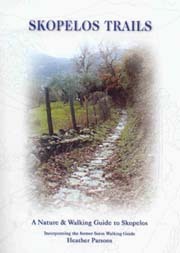 The stones are in very good condition but the trail is very overgrown. Tools were purchased from the donation money collected via the crowd funder; a chain saw, long handled loppers and sheers. Thank you very much to all the backers and thanks also to Nikos Orfanos for providing gloves and fuel free of charge. I have also FINALLY finished my mad quest to reopen the old calderimi to Taxiarchion on Palouki. 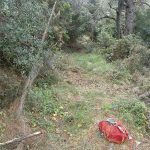 This is the section from the big goat station, which branches off the newly opened track up to the top of Palouki at the white cross, all the way past Triada (branch off there is also open now) and ends at the start of the new calderimi going down to Agios Anna and Taxiarchion. It’s taken about 5 years in fits and starts! I couldn’t bear to leave it there all closed up, as most of the way it is really clearly defined. The last section nearly defeated me, as that was not at all clear – but by working from both ends with several false starts I suddenly found the route running straight and its now clear!! Marked it with your signs! I hope a few people use it. 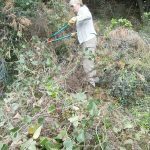 The volunteers for 2016 have been arranged via Workaway but we need more waymarker, clippers, saws, shears, gloves and I’d really like to buy our own cordless chainsaw. 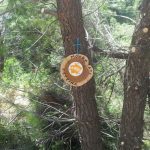 Please help us keep the trails open. I’m happy to report that the first Workaway volunteers have been booked for next Spring. They are Matthew, Michael and Anthony from New York and they’ll be arriving 22 May and will stay until 31 May. It will be good to have some actual ‘man power’ as until now, with the exception of my very first volunteer three years ago, I’ve only had girl power! We’ve managed but sometimes, only just (we had to move a lot of fallen trees recently). I’m assuming I’ll still get help from the Hotels Union as three strapping lads won’t fit in my little house!